This question is directly related to comments on the more general question and answer here. 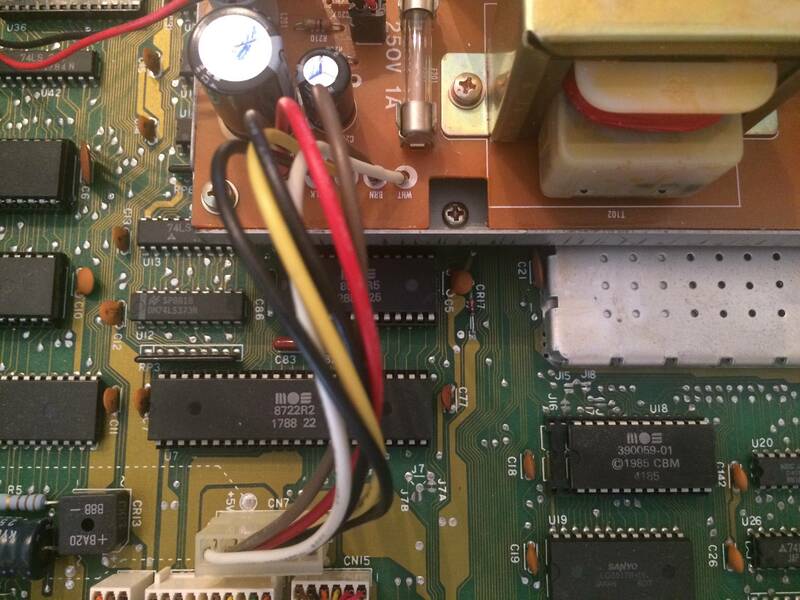 The Commodore 128D and 128D-CR have an internal PSU that can be readily and safely disconnected from the main board in order to test the supply voltages without risking damage to the computer. Checking it is a good precaution after long periods of non-use. How exactly can this be accomplished? WARNING: Electricity is dangerous. Don't open up your computer without turning off the power and allowing the capacitors to discharge. If you need these instructions for anything other than knowing how this particular computer works, do not try. The voltages involved can be fatal. Ensure the computer is safe from sparks. Place the computer on an electrically insulated worktop. See here for instructions on how to set one up. Touch the outside of the box (or better still, use an anti-static wrist strap) to earth yourself. It's probably a good idea not to be standing on a carpet; that can cause static build-up when you're walking around. Visually check for faults. If any part of the PCB has a slightly different color than the rest, and/or you see a capacitor that looks slightly odd(bulgied or even entirely blown), you should NOT power up the PSU until they are replaced with correct capacity and voltage (higher voltage is OK, but don't go below the rating on the original), and/or the PCB is cleaned. Connect the power to the PSU and turn it on. Watch and listen carefully for any arcing, sparking or burning. If there's anything suspicious, power it down immediately. Check for faults around the area that the noise / flash / smoke originated from, and skip the rest of this section. Using an AC voltmeter or oscilloscope, measure the two close-together outputs to the left. Check if the potential difference peaks at ±9V, plus or minus 0.9V. [3#2.1] If not, the AC voltage supply is faulty. Using a DC voltmeter or oscilloscope, measure the further-apart outputs to the other side. Check if the potential difference between them is 5V, plus or minus 0.5V. [3#2.1] If not, the 5V DC voltage supply is faulty. Identify the DC ground (the inside output). Using a DC voltmeter or oscilloscope, measure between the DC ground and the output next to the AC outputs. Check if the potential difference between them is 12V, plus or minus 1.2V. [3#2.1] If not, the 12V DC voltage supply is faulty. Refer to this schematic for details. Ensure that the circuitry matches the schematic above and / or the specific diagnostics on section 2.2.1 of the Diagnostics Manual. Ensure that the circuitry matches the schematic above and / or the specific diagnostics on section 2.2.2 of the Diagnostics Manual. Ensure that fuse F2 on the schematic linked above has a suitably low resistance (i.e. is not ruptured). If it does not, replace it with another fuse, ensuring that the replacement can withstand 315mA without rupturing. If there is still a problem, there is a fault with the transformer. Not the answer you're looking for? Browse other questions tagged commodore commodore-128 hardware-testing or ask your own question.